"A steakhouse quality meal in the comfort of your own home. Swanson® Beef Stock, fresh herbs and a bit of cream combine to make a sophisticated pan sauce for quality beef tenderloin steaks." Preheat oven to 425 degrees F (220 degrees C). Pat the steaks very dry with paper towels; season both sides with salt and pepper. Allow steaks to rest at room temperature for about 30 minutes while the oven pre-heats. Heat a 10-inch cast iron pan over medium-high heat for about one minute. Add the oil to pan and swirl to evenly distribute the oil. Place the steaks in the pan, allowing room between steaks. Cook without moving steaks for 2 minutes. Using tongs, lift the steaks and flip them over. If properly seared the steaks should release easily, without sticking to the pan. Immediately place cast iron pan into the hot oven. Melt unsalted butter in the same skillet over low heat; add diced shallots. Cook and stir, releasing the browned bits from the bottom of the pan, about 1 minute. Stir in the deli mustard. Increase the heat to medium-high. Whisk in Swanson(R) Beef Stock and Worcestershire sauce, continuing to scrape up browned bits from the pan. Bring to a boil and cook until slightly reduced, about 5 minutes. Reduce the heat to medium. Whisk in the cream; simmer until sauce clings to the back of a spoon, about 2 minutes. Stir in the parsley, chives, thyme, and oregano. 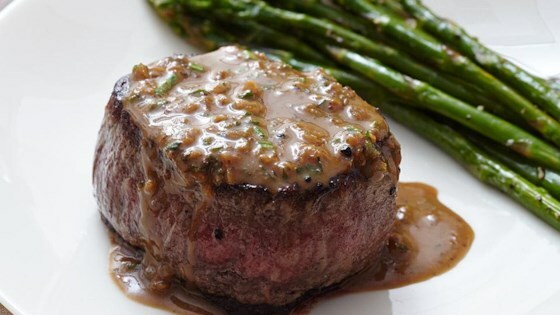 Spoon the herb sauce over steaks; serve immediately. Swanson® Beef Stock helps make a sophisticated pan sauce. Thoroughly drying the steaks and heating the oven for a full 30 minutes is essential for success of well-seared steaks. A cast iron pan is preferred but any heavy bottomed, oven-proof pan will work. Grape seed or peanut oil are preferred for high heat cooking. Our tenderloins were not that thick so oven time was a lot shorter. Came out perfect. The sauce is unbelievably good.